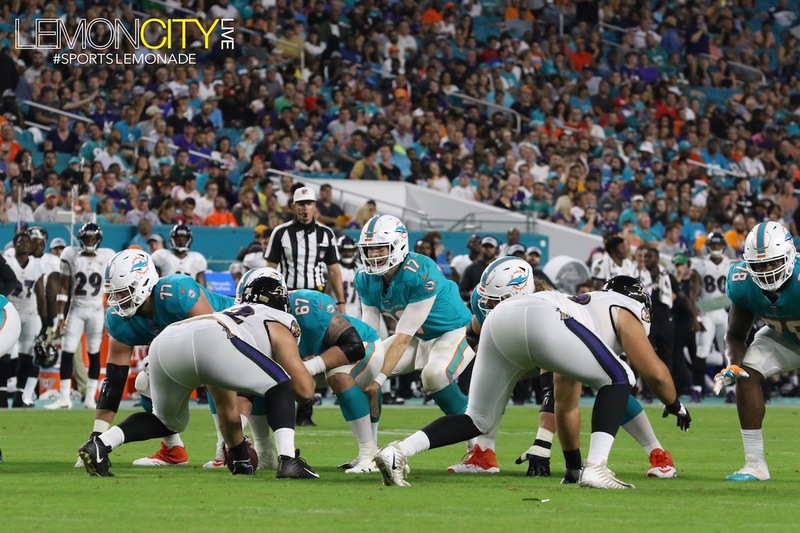 Miami Gardens, FL – The Miami Dolphins took on the Baltimore Ravens in front of 60,071 announced fans in Miami’s 3rd preseason game of the season. 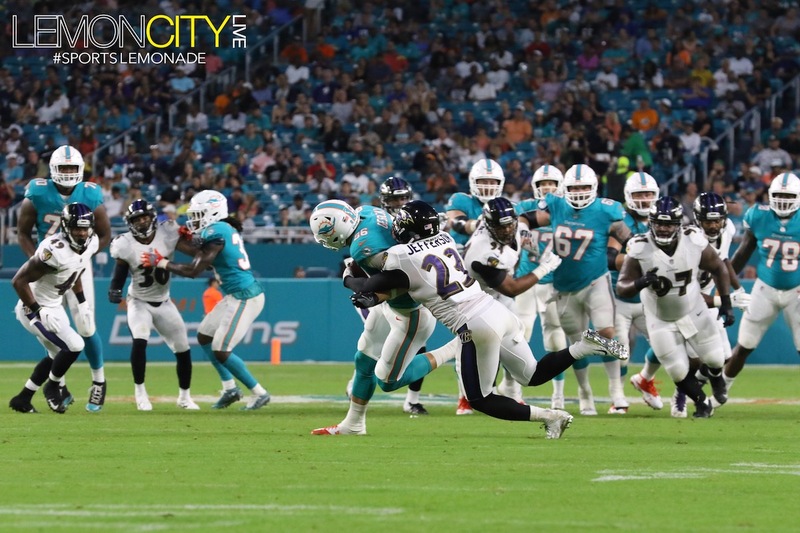 The Ravens, who played in the Hall of Fame game in Canton, Ohio on August 2nd are playing in their 4th preseason game. 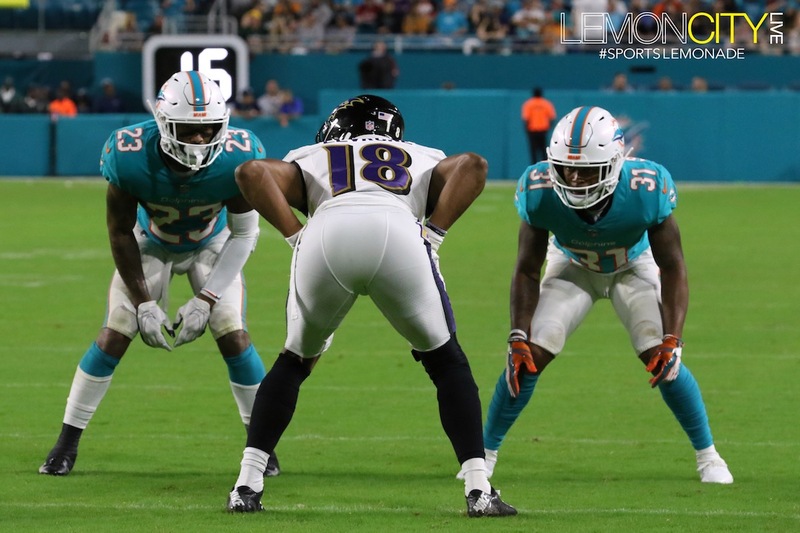 In case you aren’t familiar with how NFL preseason games are setup, the 3rd preseason game is usually when the starters play the majority of the game, more than any other preseason game, while the 4th preseason game is when all the backups play, allowing the coaches to make decisions on their final cuts before the regular season begins. 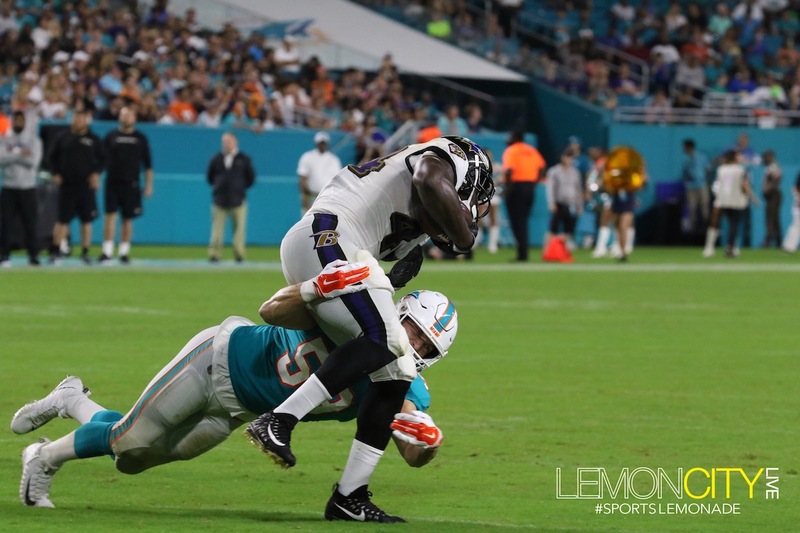 And that’s exactly what Baltimore coach, John Harbaugh decided to do. 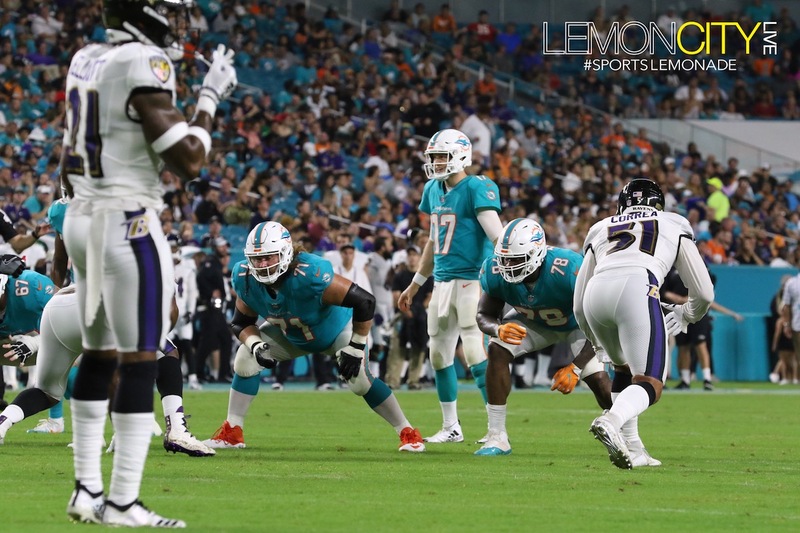 So, the Fins’ starters vs. Ravens’ backups should be no contest, right? WRONG! 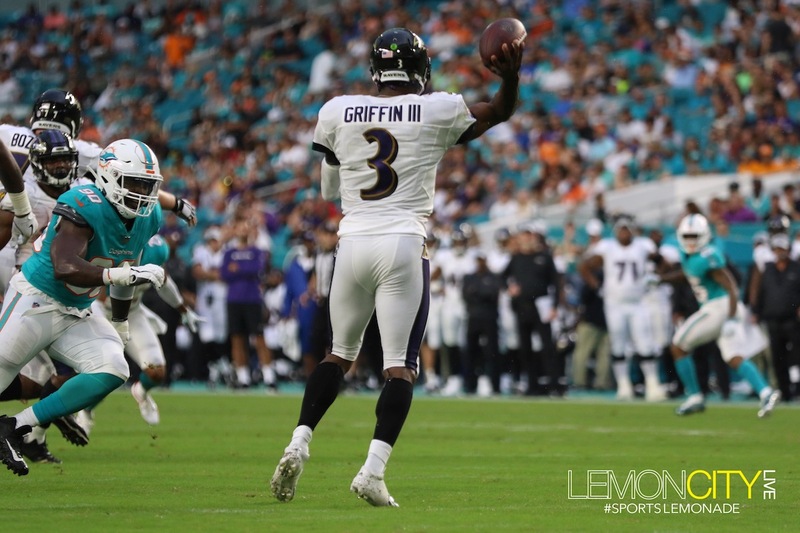 That starting Dolphins D showed up and dominated those Ravens backups, led by Robert Griffin III, who went 9/15 completed passes, good for 66 yards. 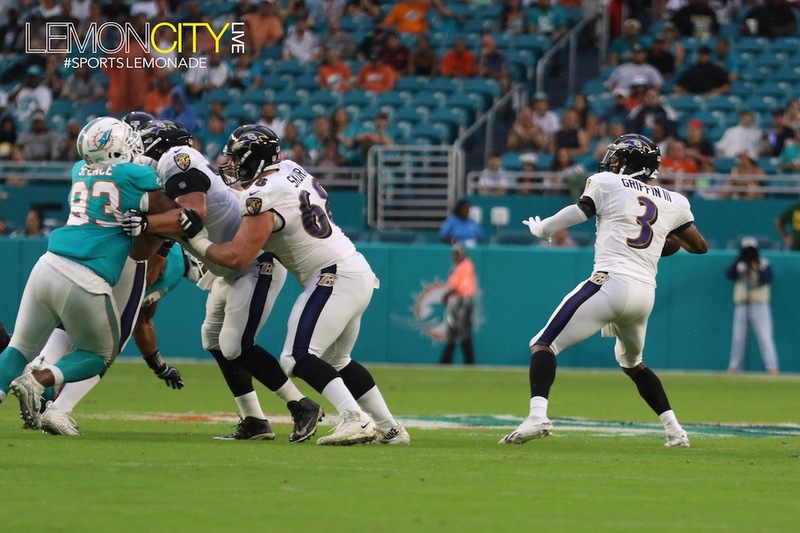 The Ravens were held to only a field-goal in the 1st half. 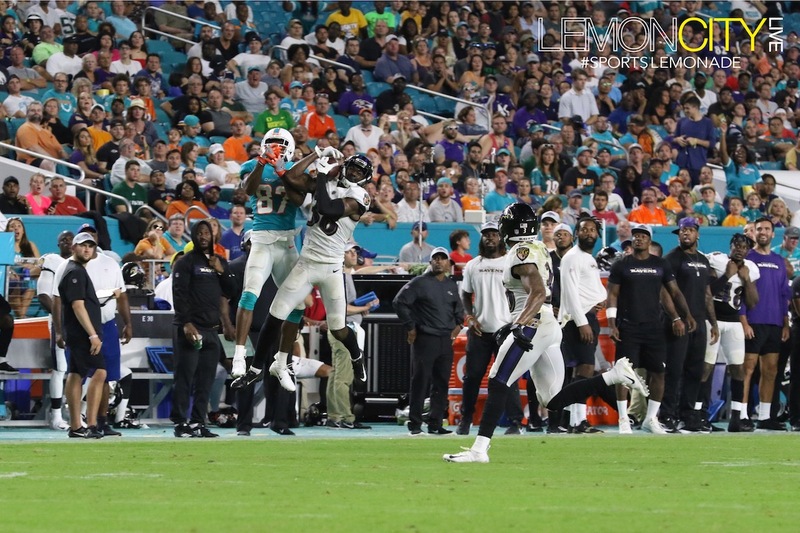 After holding Baltimore to a field-goal attempt on the very first drive of the game, which went wide left for all you fantasy football nerds doing your homework, the Fins proceeded to force a punt, block another field-goal attempt, courtesy of 2nd-year DT Vincent Taylor, force another punt, and finally they allowed a field goal. 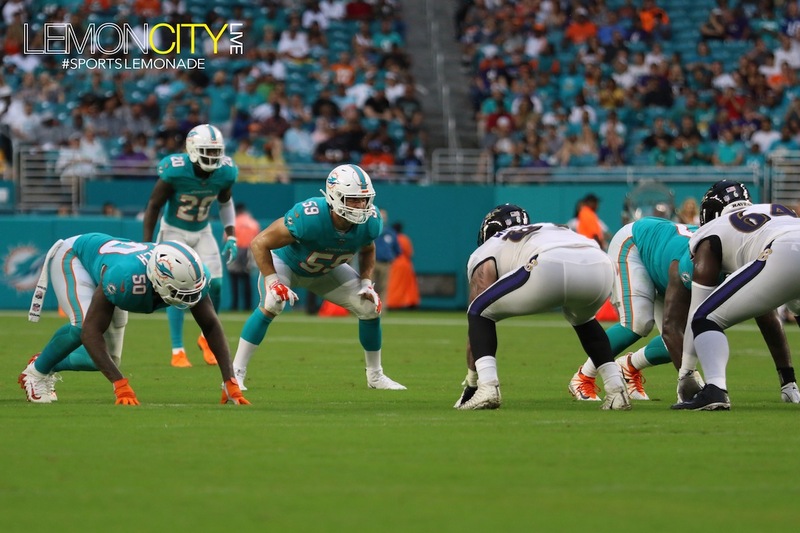 The game also saw MLB, Kiko Alonso walk to the wrong sideline. 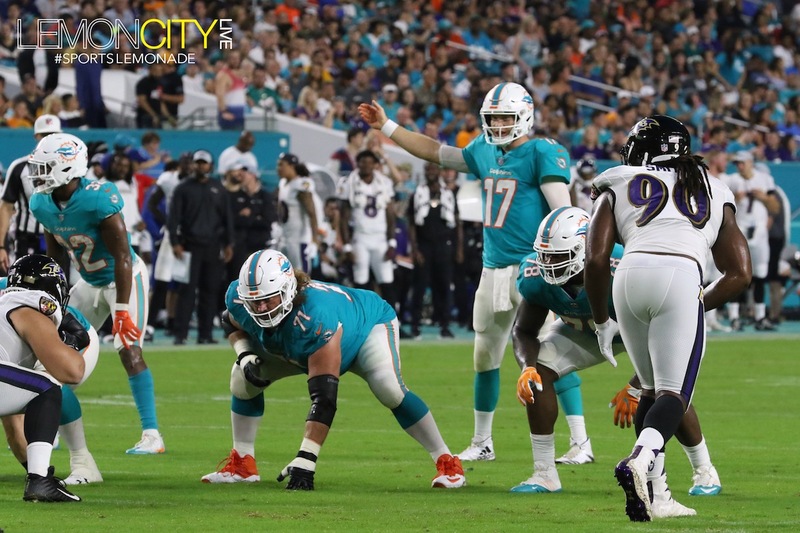 Tannehill, back from a sprained ACL and MCL in his left knee, injured during week 14 of the 2016 season, was sure to show signs of rust after missing all of last season. 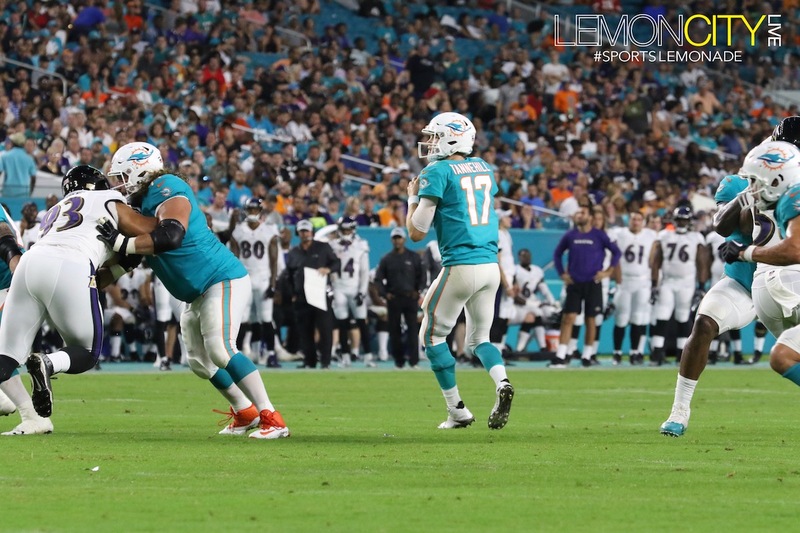 In Miami’s 1st offensive play of the game, Tannehill was sacked, and he fumbled the ball, which he did recover. 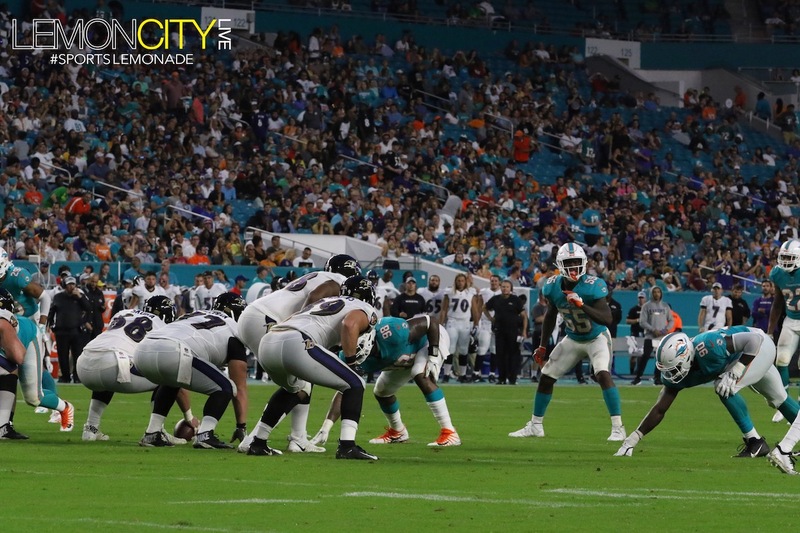 The Fins went a quick three-and-out. 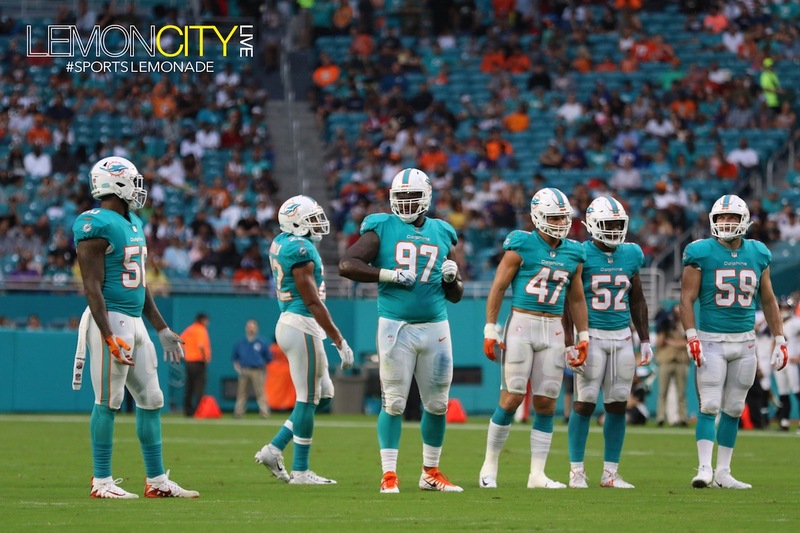 On their next drive, Ryan finally led the Fins to a 1st down conversion, in the form of a nine-yard pass to Kenny Stills, followed by a two-yard run by Kenyan Drake. 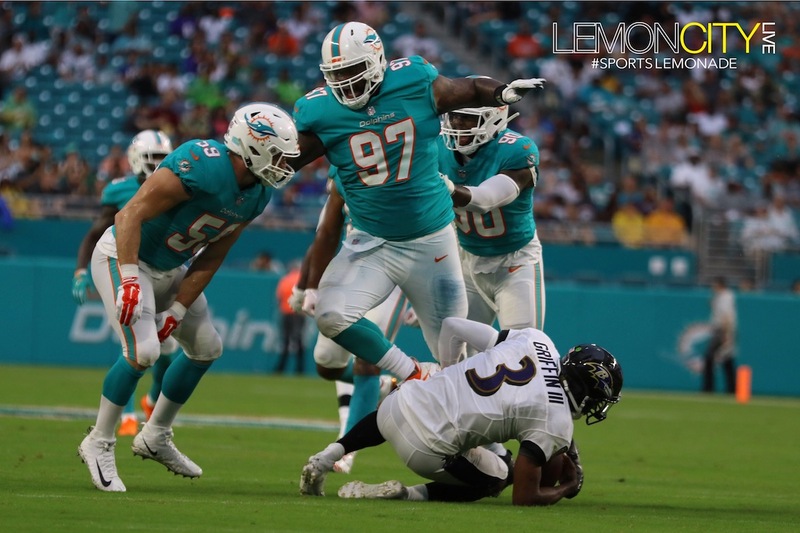 However, they were forced to punt after the following set of downs. 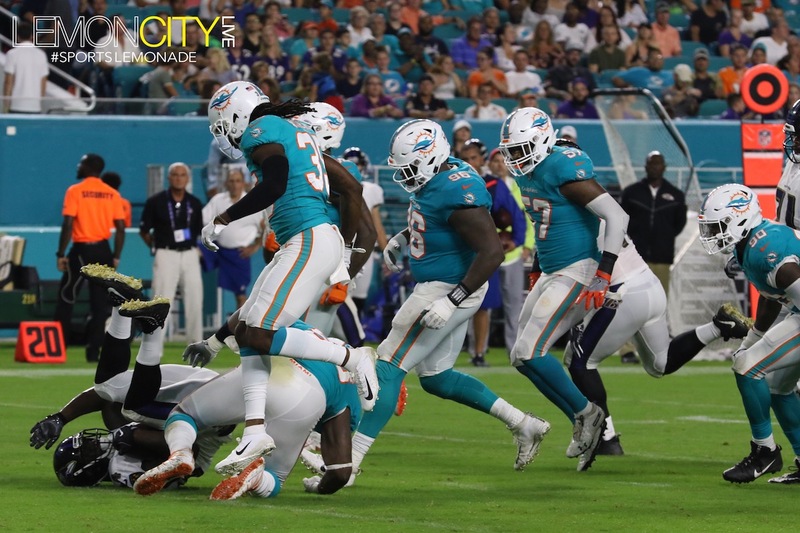 Their next series was another three-and-out, in which a botched snap caused another fumble recovered by Tannehill, but then he converted a seven-yard pass to Danny Amendola, who looked good today, going two receptions for 23 yards and a touchdown. 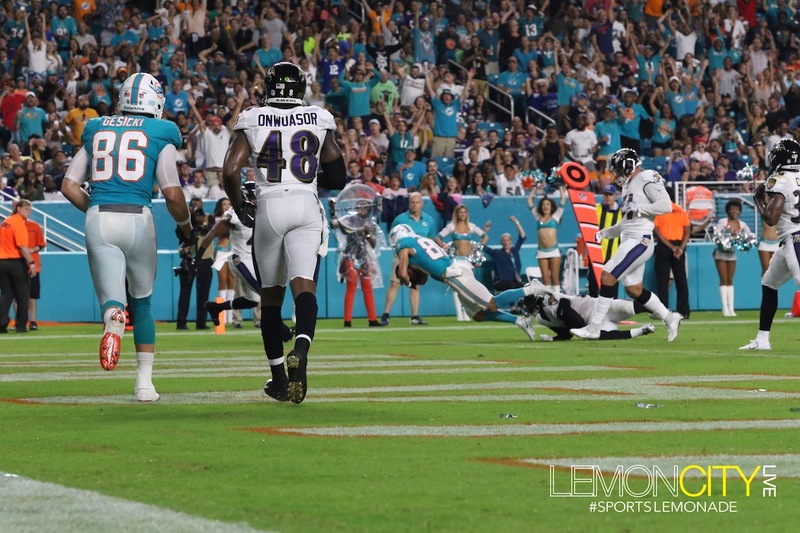 Speaking of Amendola, Miami’s only touchdown came in the beginning of the 2nd quarter. 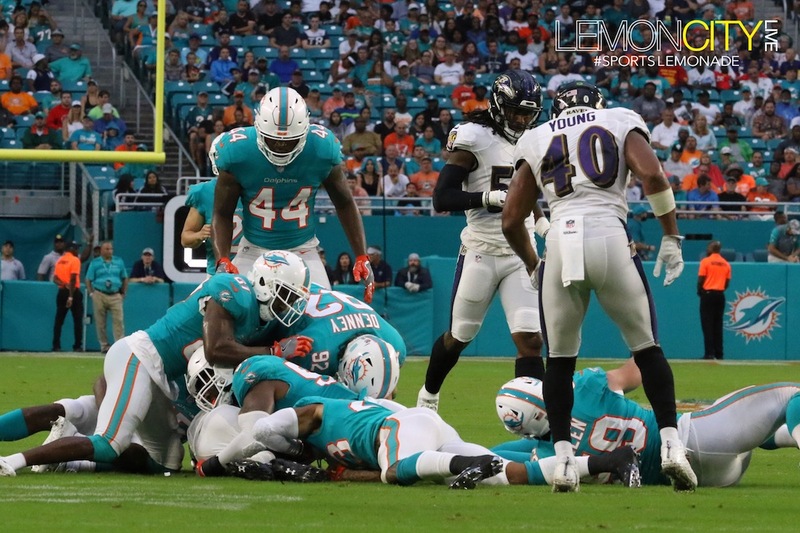 They went eight plays for 75 yards. 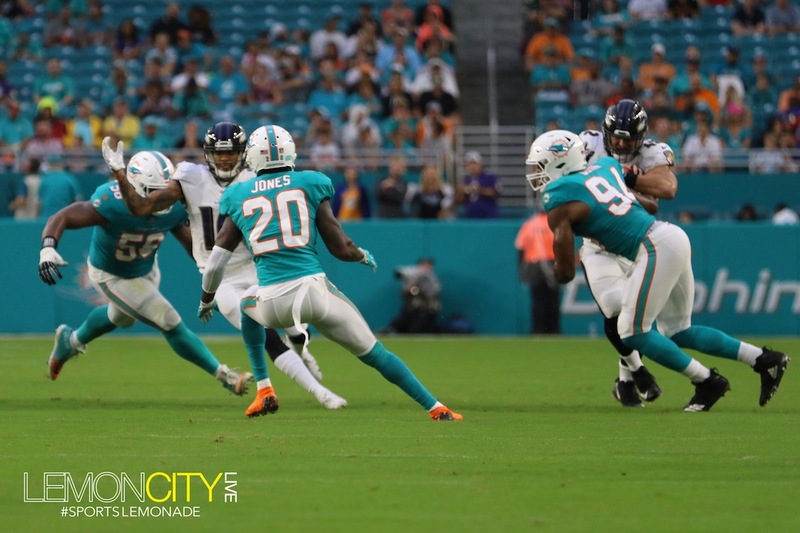 It started off with a 30-yard run from Kenyan Drake, and culminated with a 16-yard touchdown pass from Tannehill to Amendola! 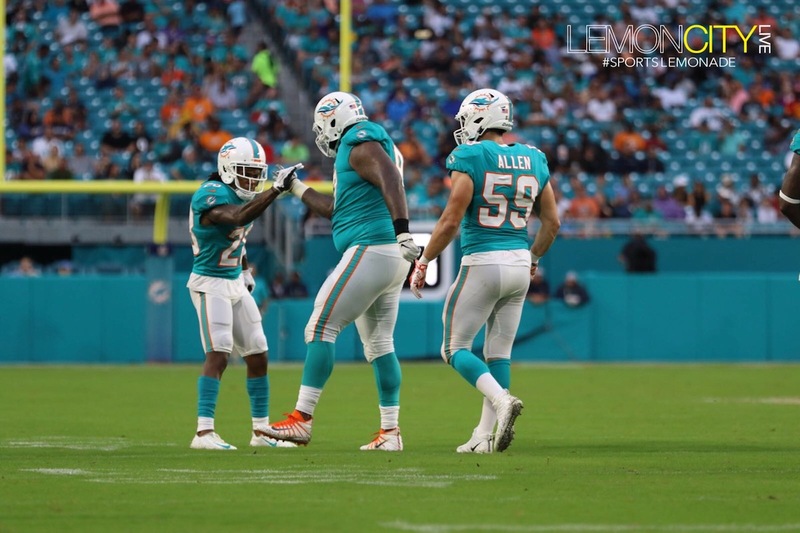 Their very next drive ended with a converted field-goal, but it started with a 36-yard pass from Tannehill to, none other than, Kenyan Drake, again! 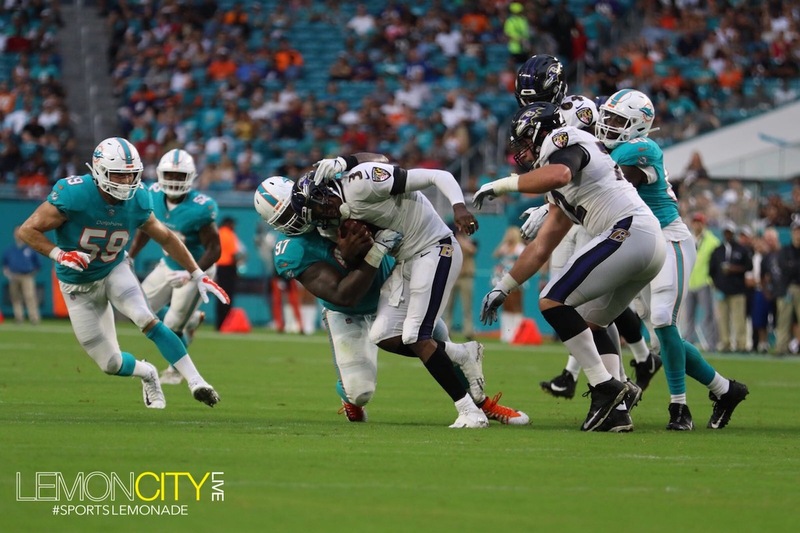 Ryan said of Drake, “When you have a guy that’s that explosive, whether he’s coming out of the backfield for a pass, or we’ve seen the last two weeks on a run, you know it really gives us a spark, it really got us moving there in the 2nd quarter. 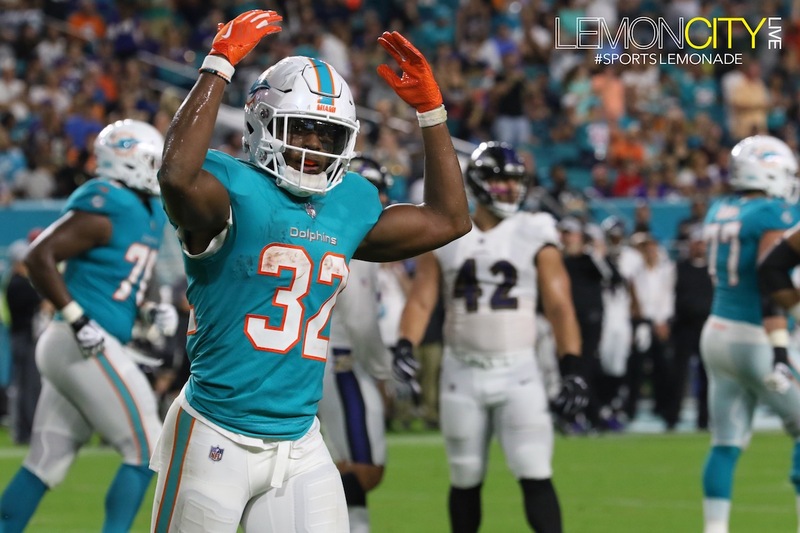 You never know when you give a guy like that, any play could be the one that hits.” For all you fantasy football nerds, which I am one too, you have to like what Kenyan brings to the stat table. 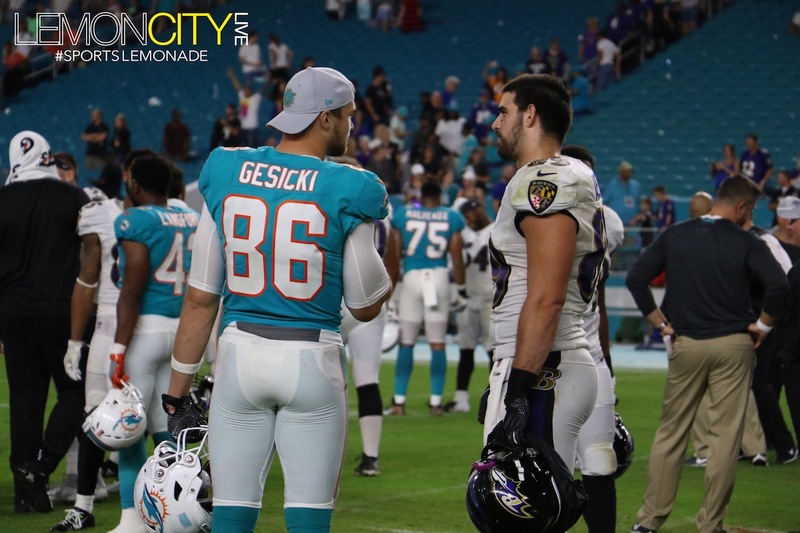 The story of the 2nd half was another guy from Miami, except he plays for Baltimore. Okay, technically he’s from Pompano Beach, but it’s all South Florida, right? 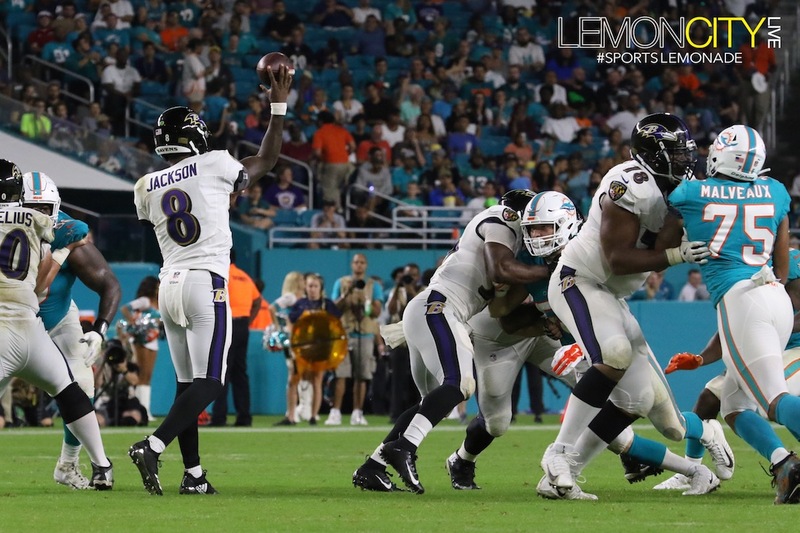 Nevertheless, Lamar Jackson made a case for himself as a legit NFL quarterback. 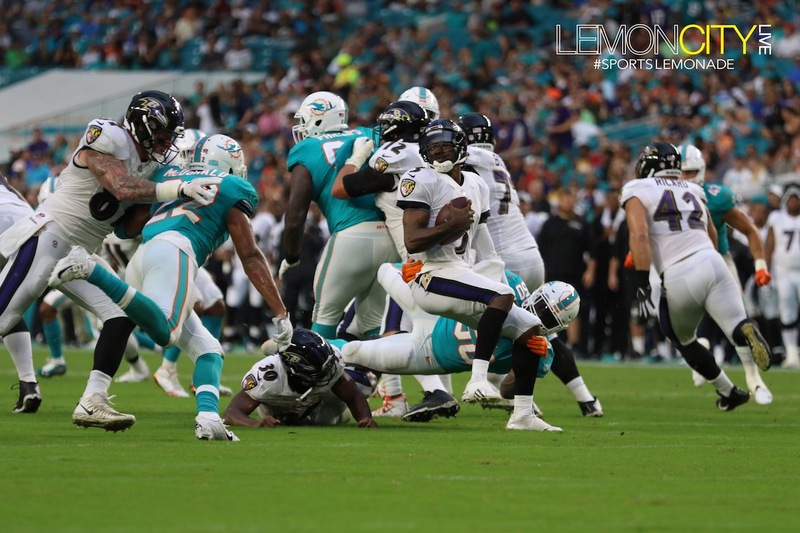 On Baltimore’s 1st drive of the 2nd half, they were pinned back to their own 13-yard line on 3rd down and 13 yards left for a 1st down. 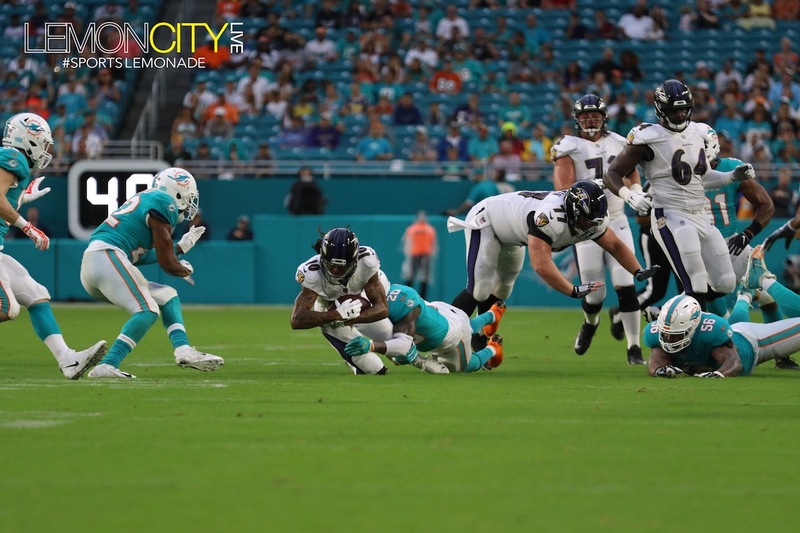 With the play breaking down, Jackson scrambled up the middle to the Ravens 26-yard line for a 1st down, keeping their series alive. 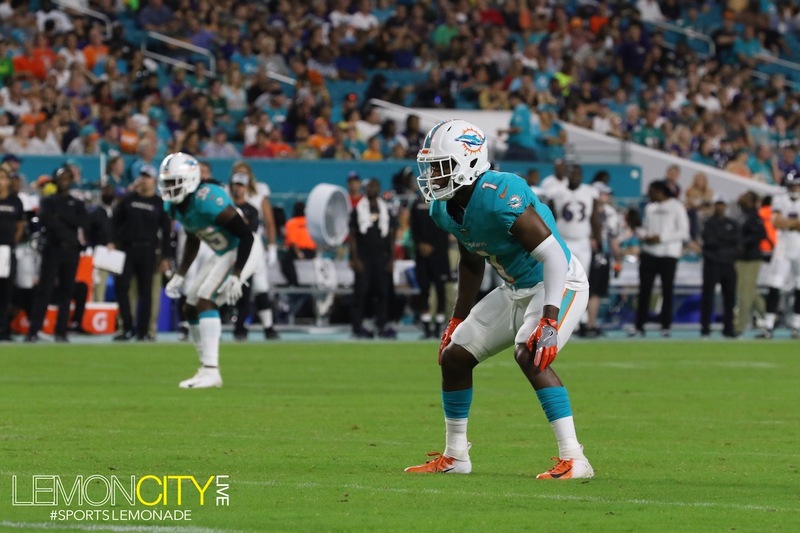 It would end on a 65-yard touchdown run by De’Lance Turner. 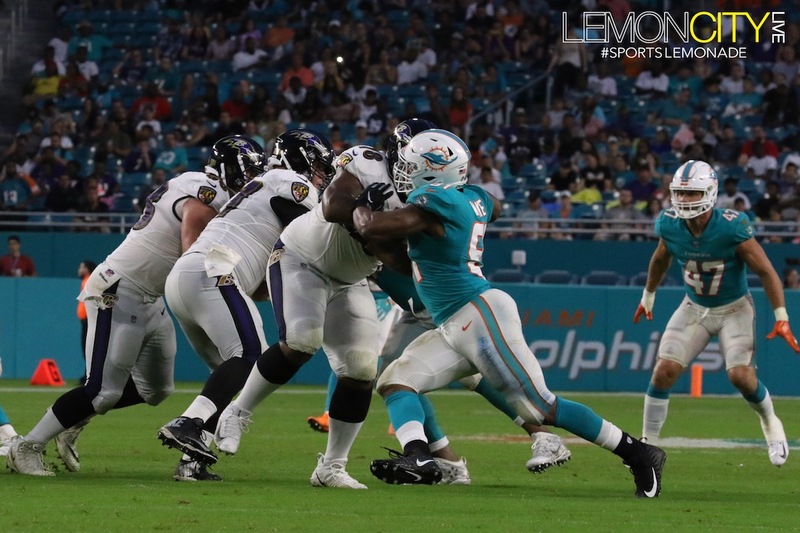 Jeez… Two drives later, Jackson would once again lead his team to another touchdown. He’s known for his feet, but the guy’s a baller. 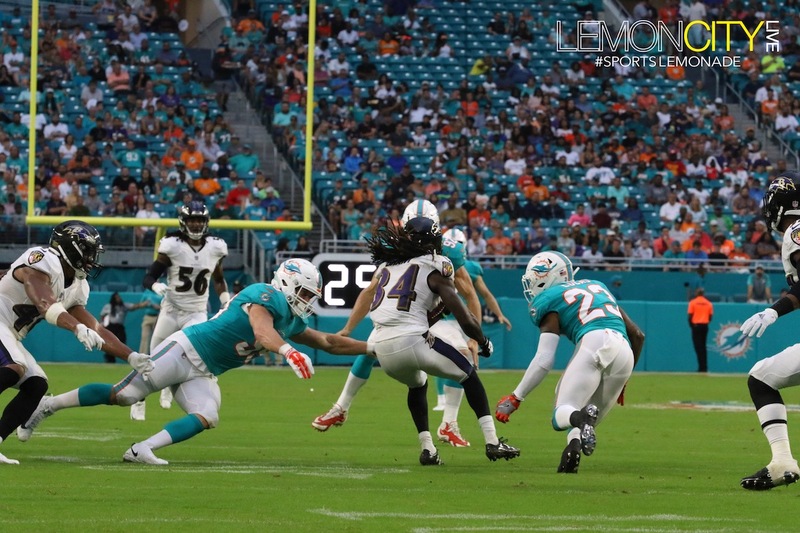 He passed for 33 yards, and ran for another 26, 19 of which were for the touchdown. And he wasn’t finished there. 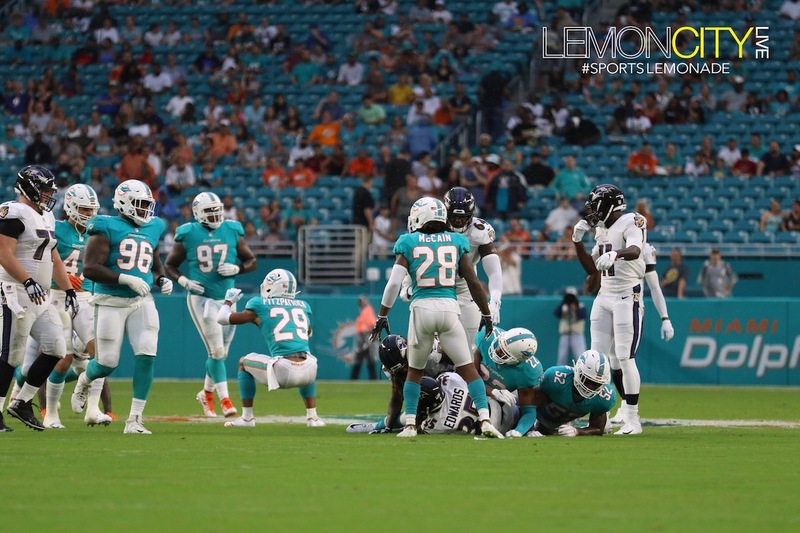 After getting the ball back, six plays and 73 yards later, he passed for 54 yards, including the 21-yard touchdown pass to DeVier Posey. 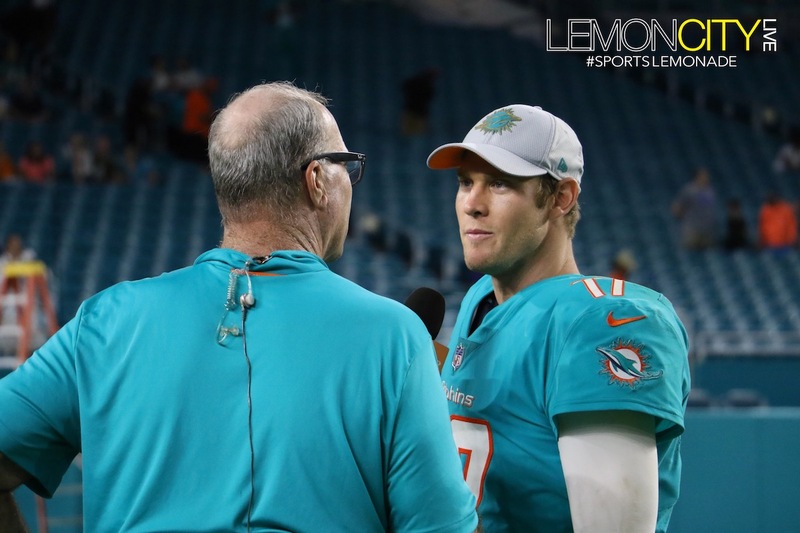 What a game for the young Quarterback. I have a feeling a lot of teams are going to be kicking themselves for not drafting him earlier in the 1st round. 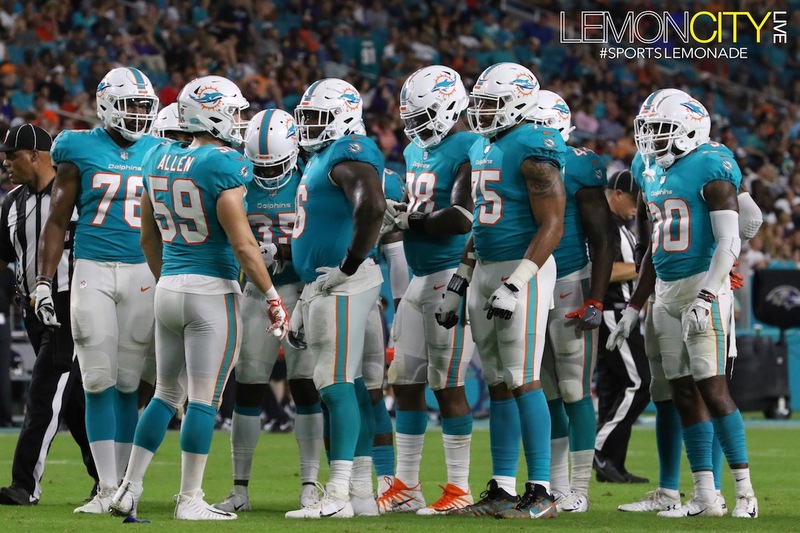 Let’s just hope the Dolphins aren’t one of those teams.